Version 2.0.0 of Dashcam Viewer adds a number of new features described below. Dashcam Viewer is available for Mac OS X and Windows (64-bit and 32-bit). Download the free version from our website. Users can now drag and drop a movie folder onto the gray area of the Player Window to load movies in that folder. The free version is full-featured, but is limited to loading up to 5 movies at a time. Purchase Dashcam Viewer for Mac or Windows for $15. Version 1.9.4 of Dashcam Viewer adds a number of new features described below. 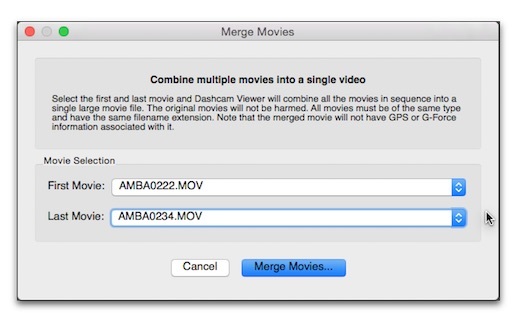 Dashcam Viewer is available for Mac OS X and Windows (64-bit and 32-bit). Download the free version from our website. The JumpTo pop-up menu now displays the movie name followed by the day of week, date and start time. This makes it easy to choose a movie based on a particular day. (Thanks to Robert Guezen for the suggestion). When the Dashcam Viewer application is brought to the foreground, all of its windows are brought to the foreground too. Previously, only the windows that was clicked on was brought to the foreground. This keeps Dashcam Viewer pieces together! The Export Movie button has been promoted to a full-fledged toolbar button. [Mac] Added support for ION Dashcam WiFi (Thanks to Ian M. for sample files).